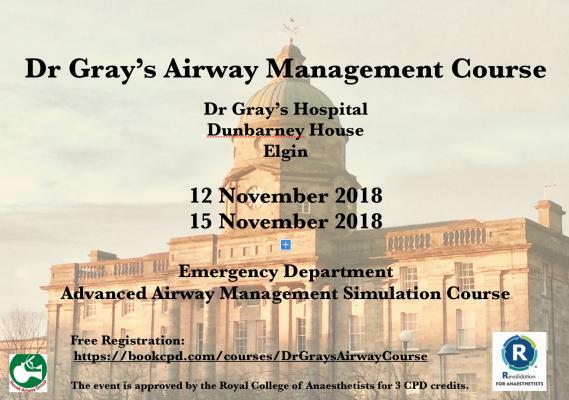 Dr Gray’s Airway Management Course is the Advanced Airway Skills Half-Day Simulation Course aimed at NHS Grampian nurses, ODPs, paramedics and doctors in training. The course is fully recognised as a CPD activity by the Royal College of Anaesthetists and given 3 CPD credits. This course offers a small group personalised teaching with only 6-8 participants, short practical lectures about DAS Guidelines for difficult intubation, extubation and airway management in obstetric patients, difficult airway trolley and ABCD plan. The practical part of the course is concentrating on usage of supraglottic airway devices, videolaryngoscopes, fibreoptic intubation, cricothyrotomy on trainers and finally simulation scenarios in small groups using low fidelity manikins.